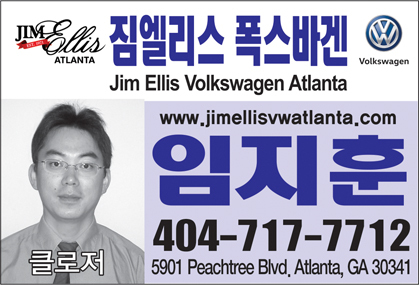 Korean American Medical Student Association of Georgia hosts the third annual pre-medical forum with physicians of Korean American Medical Association of Georgia. 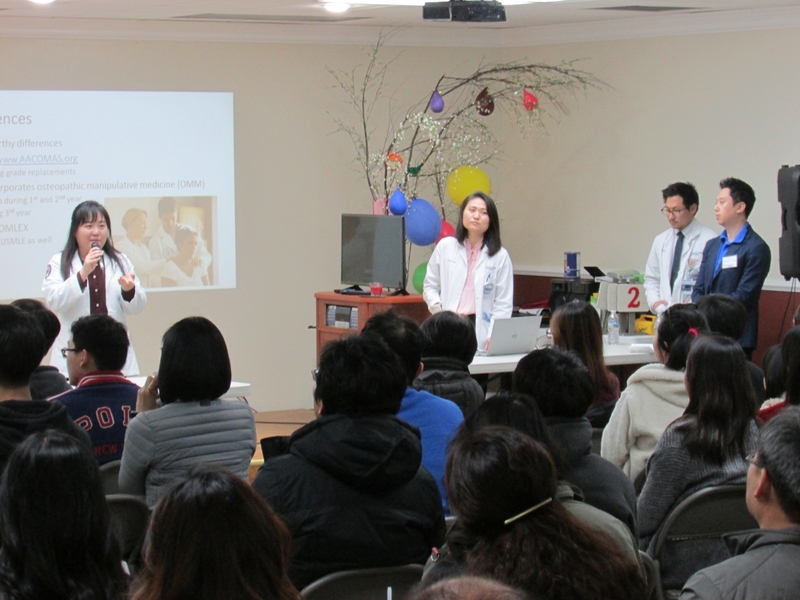 Korean American medical students continued on community reach on January 13th at the Korean Culture Center, Norcross, by providing a line of fruitful information of how to get ready for medical school admissions. 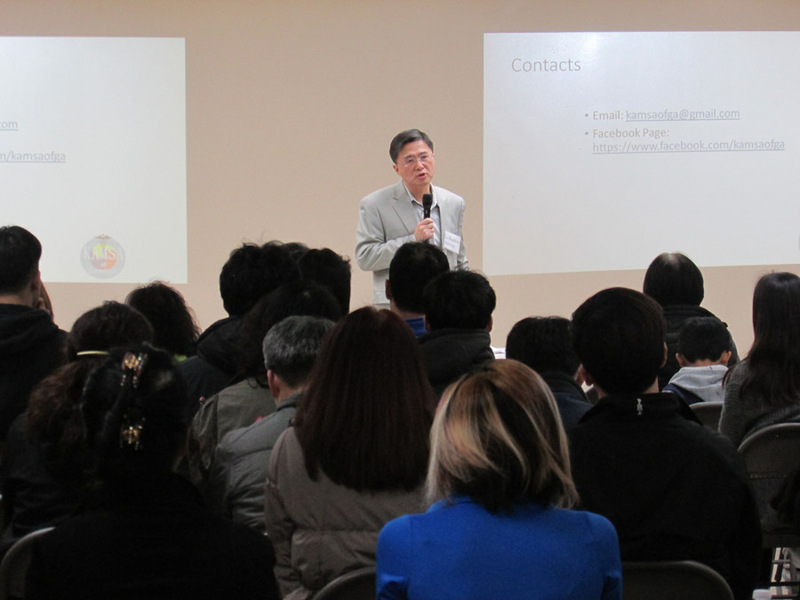 This pre-medical forum by the Korean American Medical Student Association of Georgia (KAMSA) aimed to have aspiring medical students and their parents learn tips and advice about applying to medical school, life as a medical students and the medical profession, featuring extracurricular activities, research, taking a gap before matriculation, how to prepare for MCAT, interview, financing, and the today and tomorrow of the medical profession two prominent local physicians spoke: Brice B. Choi, Chairman of the Board of Korean American Medical Association(KAMA) and Peter Rhee, Chief of Surgery at Grady memorial Hospital. He is also a retired US Navy Captain with 24 years of active duty. According to KAMSA, recently, Emory University School of Medicine received 8,107 applications, but only 691 applicants were interviewed based on the first-year class demographics of 2015. Only 139 students turned out to attend in the first-year class, featuring 84 female and 55 male. What about the Medical College of Georgia, in Augusta and Mercer University School of Medicine? While the Medical College of Georgia had 217 students, Georgia residents and 13 non residents, tallying the total 230 practical enrollment composed of 120 female and 110 male, Mercer University School of Medicine, whose class size was 100, indicates the average GPA of students admitted to the medical school is 3.61 and the preferred MCAT minimum test score for the admission is 494. Tuition also matters when future medical students finalize their decision. Emory amounts to $49,800 per year while Medical College of Georgia is $27,802(in-state) vs. $55,606(out-of-state), Mercer is $41,757, GA-Philadelphia College Osteopathic Medicine(PCOM) is $48,024, and Morehouse is $43,805. Pre-requisite courses are specific for each school, but generally the minimum course Emory requires are: 8 semester hours (with lab) in biology; 8 semester hours (with lab) in general or inorganic chemistry; 8 semester hours (with lab) in organic chemistry; 8 semester hours (with lab) in one of the physical sciences; 6 semester hours of English; 18 semester hours of humanities and social and/or behavioral sciences. Aspiring medical students may want to refer to Medical School Admissions Requirements (MSAR) online resource. The decision is all time tough and even more so in applying to reach/dream medical schools where you are a competitive applicant. The pre-medical panel of KAMSA recommends 10 to 20 schools including in-state schools to play the odds and win at the end of the day. Factors to consider are location and admissions cost (in-state vs. out-of-state preference), academic focus of the school (research oriented vs. primary care oriented), the curriculum of the school (traditional lecture-based vs. problem-based learning, accelerated curriculum), grading system, GPA, and MCAT score. When it comes to MCAT test, it takes the total 7 hours and 33 minutes in one seating, except for a short break time. It comprises of Biological and Biochemical Foundations of Living Systems (59 questions-95 minutes); Chemical and Physical Foundations of Biological Systems (59 questions-95 minutes); Psychological, Social, and Biological Foundations of Behavior (59 questions-95 minutes); and Critical Analysis and Reasoning Skills (53 questions-90 minutes). The score per section ranges from 118 to 132 and the average score is 125. The scores for each section sum to the total and the total score ranges from 472 to 528. The average total score is 500 points. Personal Statement is a story to complement an applicant's application. What should they write about? The personal statement should describe events/turning points, experiences, and how you were affected and why medicine. They should address the prompt, but just show, don’t tell. It should elaborate on 3 or 4 major experiences and how they changed you on top of 3 or 4 experiences that demonstrate qualities you want to convey. The origin of interest in medicine is plus. 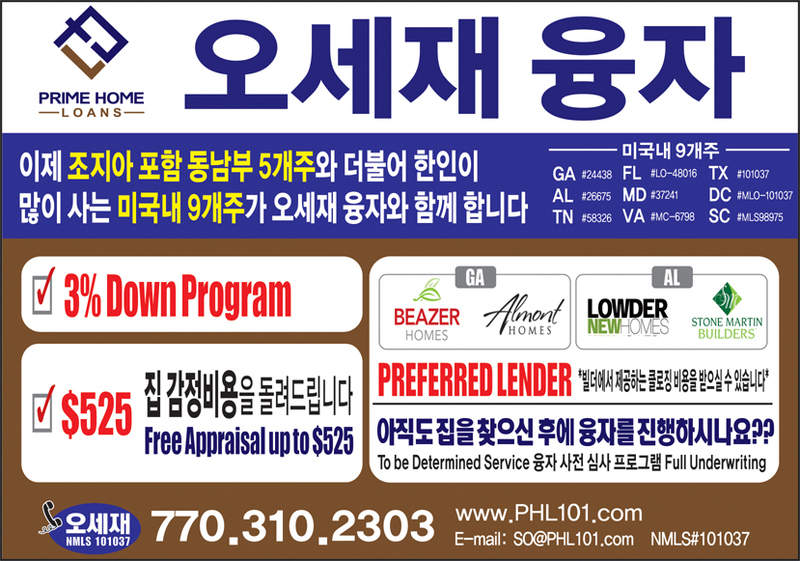 The pre-medical panel claimed that they would be willing to lead the way to encourage aspiring Korean medical students. 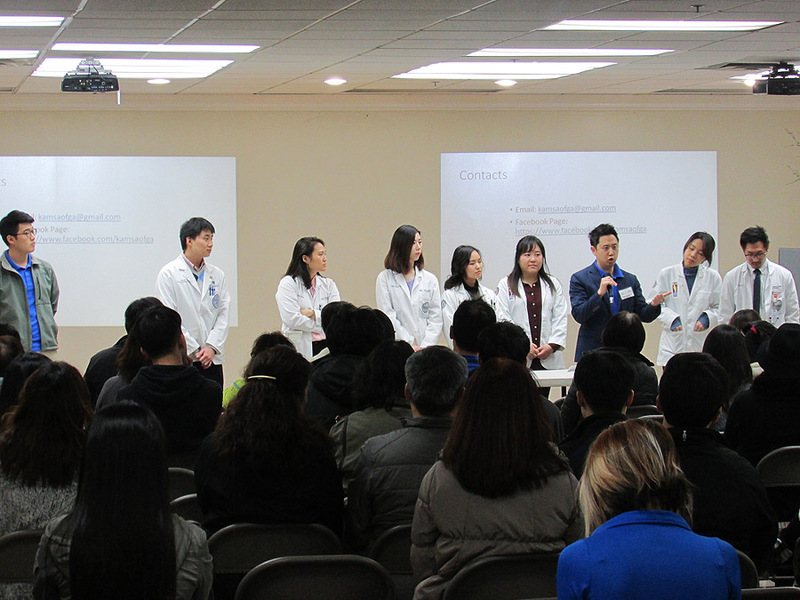 KAMSA imparts how to apply to medical school, life as a medical students and the medical profession, featuring extracurricular activities, research, taking a gap before matriculation, how to prepare for MCAT, interview, and financing to the attendees. 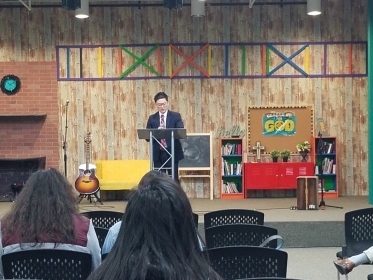 Brice B. Choi, Chairman of the Board of Korean American Medical Association(KAMA), speaks about the today and tomorrow of the medical profession.